A measure in the state legislature would phase out emissions testing. State lawmakers are considering a proposal that might mean the end of vehicle emissions testing in Tennessee. Critics say the tests today are an unnecessary hassle and expense for car owners. But stopping them is not going to be simple. The Senate Transportation Committee voted this week to approve a measure designed to wind down annual emissions tests in the six Middle and East Tennessee counties where they're currently required. The committee's chairman, Sparta Republican Paul Bailey, describes Senate Bill 2656/House Bill 1782 as deregulation. Now that the air is cleaner than it once was, Bailey says there's no reason to subject Tennessee car owners to emissions inspections. "Sure, there's more cars and trucks on the road," he says, "but because of manufacturing standards (that) have been put in place, we're now seeing that there's a lot less emissions being emitted by our vehicles." 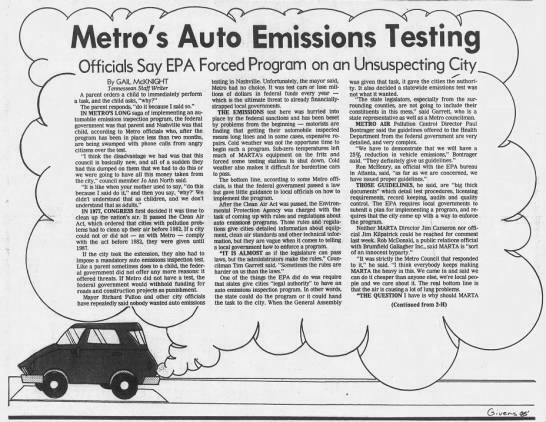 Emissions tests began in the mid-1980s in Tennessee to clean up the air in heavily polluted cities like Nashville and Chattanooga. As The Tennesssean explained in a 1985 article, they were required by the Clean Air Act. Six counties currently have mandatory emissions tests: Davidson, Sumner, Rutherford, Williamson and Wilson counties in Middle Tennessee and Hamilton County in East Tennessee. Each has reached an agreement with the Environmental Protection Agency that gives credit toward clean-air standards. Stopping emissions tests could cost Tennessee millions in federal funds, according to an analysis done by legislative staff. Ending those tests would not be easy. Not only would it require renegotiating with the EPA. Local governments would also need to get out of their contracts with emissions testers. Five of the counties have contracted with the Tennessee Department of Environment and Conservation to test vehicles through 2019. Davidson County has an agreement with a private vendor that runs until 2022. Republicans want to keep local governments from signing new deals. They say the tests aren't needed and that they unfairly burden the poor, since they tend to drive older cars, which can require costly fixes. But environmentalists counter that, because low-income people already tend to live in places that are more heavily polluted, they'll suffer the most if clean-air standards are lowered. "The transportation sector is one of the largest contributors to harmful air pollution," says Anne Passino, a staff attorney for the Southern Environmental Law Center. "Too many parts of Tennessee have a history of failing to meet air quality health standards; as our state grows, we need to make sure to safeguard and strengthen the tools in place to keep Tennesseans healthy and our air clean." TDEC also has expressed concerns. A spokeswoman says they could suggest changes to the measure before it reaches Gov. Bill Haslam's desk. In an industry dedicated to beautifying, hair salons have been unwittingly degrading the environment. Chemicals are poured down the drain and enter the water supply, and waste bins are filled to the brim with bottles and tubes of hair products and foils, which end up in a landfill. Now, two hair salons in Nashville are cutting waste through a program by Green Circle Salons, a young company in Toronto that is attempting to help the industry reduce waste. A coalition of Tennessee groups has secured the backing of high-profile Republican lawmakers on a $35 million proposal to protect water quality, farmland and Civil War sites. To become the “greenest city in the Southeast” — as Mayor Megan Barry says it — Nashville will need to increase recycling, add solar panels atop government buildings, and plant 500,000 trees.